Run Cow Run, is a free Windows 8 running game app. 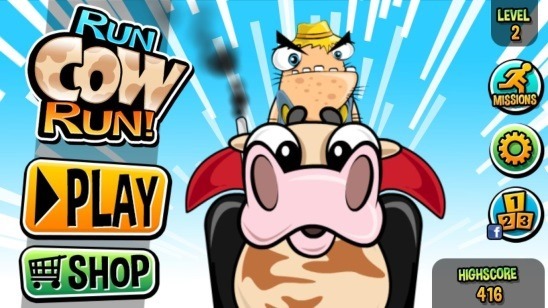 Free running in the sense that, you have to help the cow run and rescue all the animals by using different powers which you can buy with the coins that you collected during the game play. You’ll get multiple obstacles on your way such as haystacks, ice cube, wooden boxes, windmills etc. Avoid these by jumping over them and sliding under them. The game is quite popular among the users, and also got the “Best Running Game Award” by GameIS. Downloading it won’t be an issue, as it is quite lightweight and is available in the Games Category in Windows Store. 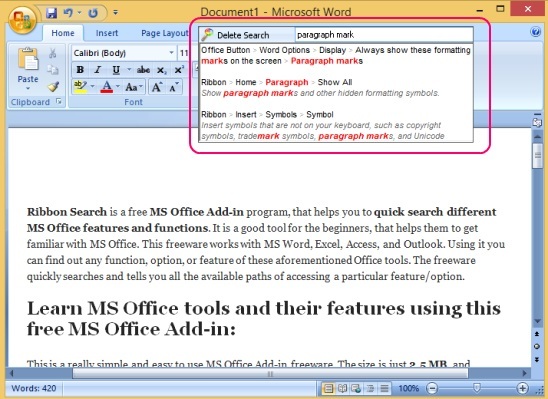 Use the Windows 8 Search Charm to locate it in Windows Store, or the download link given at the end of this article. 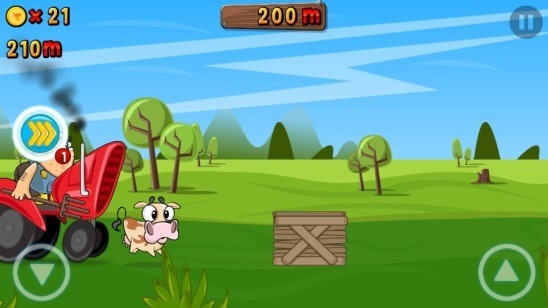 Like I mentioned above the game is all about helping the cow run, and get to the longest run for achieving high score. Well, actually the hero of the game “Cow”, one day realizes what happens to all farm animals at the butchery and makes an escape for her life. While being chased by the angry farmers, she rescues other farm animals like pigs, chicken, ducks, sheep etc. from their cages and grabs as many coins as possible; trying not to end up as a steak at the farm’s slaughterhouse. And ultimately emerge as a hero from a little cow. Well that was the whole story, now here are the gameplay details. The game actually works really well. 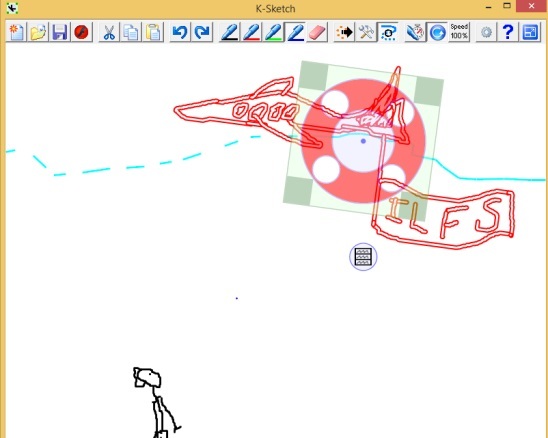 This Windows 8 running game is simple yet amusing. I liked the graphics very much; they are filled with different lively colors and are cute. The game is in 2D, and camera shows the side view. The game controls are very easy to learn, and works very well, but not too easy to master. And, it took a little time for me to get a complete control over the jumps and slides. 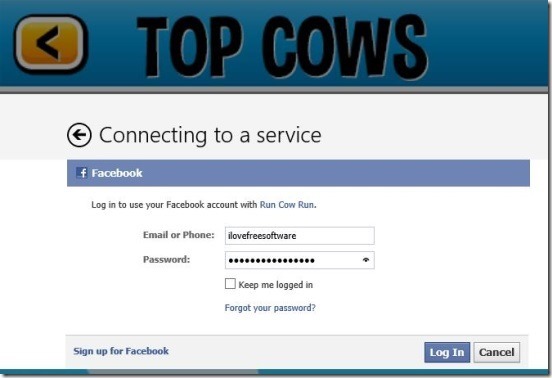 The cow runs automatically, that is you don’t have to run the cow. All you have to do is make the cow jump and slide. Use the up arrow key to jump, press it twice to jump more higher, and press the down arrow key to slide. You have to jump higher, because during the game, you’ll meet multiple big and tall piles of obstacles. Also, at regular time intervals, the vicious farmers chases you with his tractor, and try to run you over and pokes you with pitchfork. Avoid these and the obstacles because these all kill you. 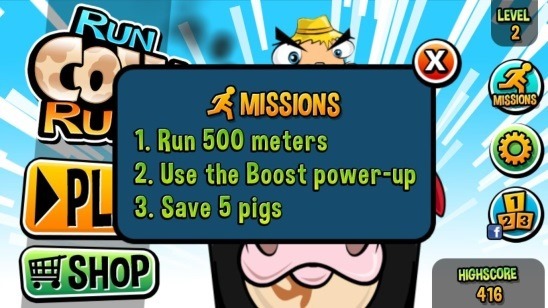 The game consists of different missions such as: Run 500 meters, use Boost power-up, save 5 pigs etc. Completing these missions unlocks new levels, and gives you points. The game might sound a bit difficult at this point. But there’s no need to worry, because during your run, you can collect multiple power-ups, using which you can drive the farmer away, run with faster speed, blast incoming obstacles, get coin magnets, antibiotics, shields and save me. 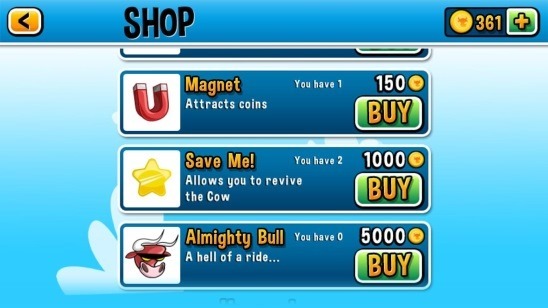 If you run out of powers then you can buy them using the coins you collected during your run. To buy powers click on Shop Button at the Home Screen. You can connect to your Facebook account and share the high scores with Facebook friends, and challenge them to beat your high score. If you liked this game app, then you should also check these free Windows 8 game apps: Ragdoll Run and Agent P Strikes Back. Good Windows 8 running game app. Use multiple powers to achieve high score. Connect to your Facebook account and challenge Facebook friends. Eye candy graphics and characters. 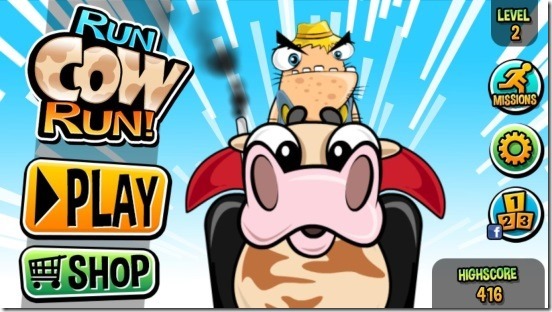 Run Cow Run, sure is a good Windows 8 running game app. It is a game for all, alike. The game graphics are very eye catching. The music and the sound are all in the great row. I did really spent a lot of time playing the game, and I am sure you’ll too. And the best thing about the app is, you don’t need to be connected to play the game, but for connecting to Facebook you’ll need internet. 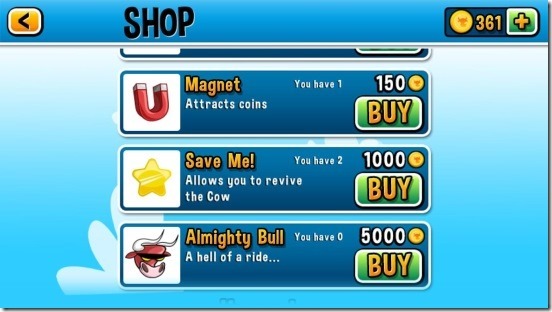 All in all, a must have game app for Windows 8. Grab Run Cow Run here.